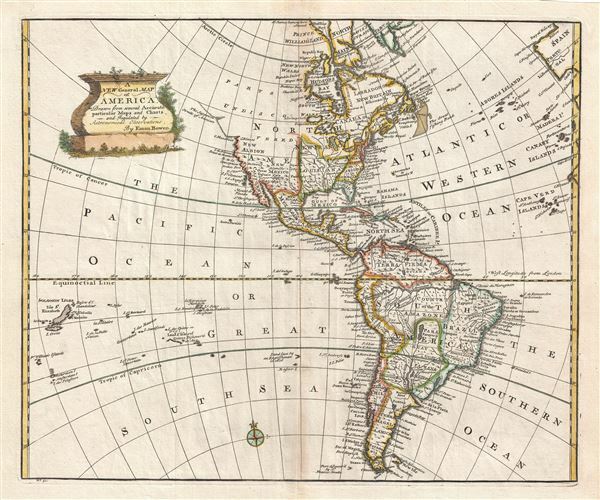 This is a stunning 1747 decorative map of the Western Hemisphere by the English cartographer Emanuel Bowen. It covers North and South America as well as much of the Pacific and the Atlantic as far as Spain and the Canary Islands. The map details America during the Colonial Period. In North America, England controls the colonies along the eastern coast of the continent and surrounding the Hudson Bay. France occupies Louisiana, parts of Canada, and the Great Lakes region. Spain controls the western part of the continent as well as Florida, Mexico, most of the West Indies and, with the exception of Portuguese Brazil, all of South America. South America is well mapped with numerous Amazon tributaries noted. Bowen includes the apocryphal Lake of Xarayes as the northern terminus of the Paraguay River. 'Xarayes' is a corruption of 'Xaraies' meaning 'Masters of the River. The Xaraies were an indigenous people occupying what are today parts of Brazil's Matte Grosso and the Pantanal. When Spanish and Portuguese explorers first navigated up the Paraguay River, as always in search of El Dorado, they encountered the vast Pantanal flood plain at the height of its annual inundation. Understandably misinterpreting the flood plain as a gigantic inland sea, they named it after the local inhabitants, the Xaraies. The Laguna de los Xarayes almost immediately began to appear on early maps of the region and, at the same time, almost immediately took on a legendary aspect as the gateway to El Dorado. A beautiful title cartouche adorns the top left quadrant of the map. This map was prepared by Emanuel Bowen as plate no. 51 for the 1747 issue of A Complete System of Geography.